In the wake of the anthrax letters following the attacks on the World Trade Center, Americans have begun to grapple with two difficult truths: that there is no terrorist threat more horrifying -- and less understood -- than germ warfare, and that it would take very little to mount a devastating attack on American soil. In Germs, three veteran reporters draw on top sources inside and outside the U.S. government to lay bare Washington's secret strategies for combating this deadly threat. 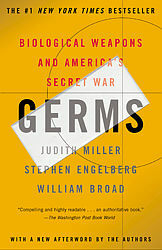 Featuring an inside look at how germ warfare has been waged throughout history and what form its future might take (and in whose hands), Germs reads like a gripping detective story told by fascinating key figures: American and Soviet medical specialists who once made germ weapons but now fight their spread, FBI agents who track Islamic radicals, the Iraqis who built Saddam Hussein's secret arsenal, spies who travel the world collecting lethal microbes, and scientists who see ominous developments on the horizon. With clear scientific explanations and harrowing insights, Germs is a masterfully written -- and timely -- work of investigative journalism.